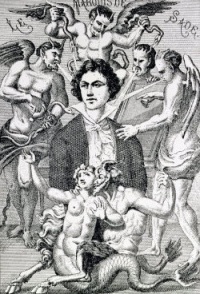 Marquis de Sade spent about 29 years and six months of his 74 years in prison. Taking into account that the first time he went to prison he was 23, this means that he spent 29 years of his 41 years adult years in prison, meaning 12 years of freedom. * the numbers need recalculation. Unless indicated otherwise, the text in this article is either based on Wikipedia article "Sade in prison" or another language Wikipedia page thereof used under the terms of the GNU Free Documentation License; or on original research by Jahsonic and friends. See Art and Popular Culture's copyright notice. This page was last modified 08:06, 25 April 2014.